An alert reader wondered what I was talking about in reference to The Pyramid and Isaac Tigrett's crystal skull in a story I wrote about Bass Pro Shops a couple of weeks ago. He thought it sounded pretty cool and kind of Indiana Jones-ish. Such overwhelming response demands an answer. Old fogey reporters have an annoying habit of dropping obscure information into columns and stories. Occupational hazard. Here's the back story, mined from our pre-Internet archives by the Flyer's crack research department, also known as the guy at the front desk. In late 1991, The Pyramid was new and exciting. Befitting the weird building, there was a weird rumor that, during construction, workmen were paid to weld a metal box inside the apex. The installation supposedly took place late at night, with the mysterious box carried by persons dressed in black and carrying a transit pointed to the North Star. One thing led to another, and in December an expedition of county officials and Pyramid management climbed to the top to have a look. Sure enough, there was a metal box welded to a beam 300 feet above the Mississippi River. Someone mounted a ladder and detached it. It was stuck in a vault over the weekend. When it was opened, there was a wooden box inside the metal box and a black velvet box inside the wooden box. 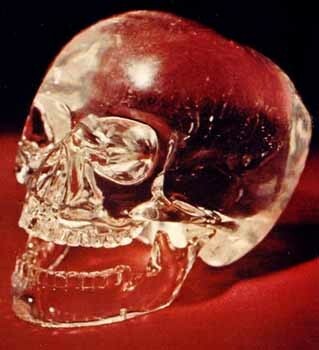 Inside the velvet box was a crystal skull about the size of a man's fist, with sunken eyes, a sunken nose, and elongated teeth. In a drawer beneath it were some magazine clips and a fax transmission to Isaac Tigrett, cofounder of the Hard Rock Cafe and son of Pyramid guiding light and patron John Tigrett. Isaac Tigrett was a New Age fan and disciple of guru Sri Baba. The next day, Isaac Tigrett confirmed that he had placed the skull in The Pyramid as part of a time capsule to generate future publicity for the project. The skull was eventually returned to him. He said it was intended to be part of a promotion called "The Egyptian Time Capsule." The consequences of removing this spiritual battery from its Pyramid nest is a topic for anthropologists and spiritualists to debate for centuries. A Texas man who gave workshops on crystals and did channel readings opined in 1992 that "it's possible the people who put the skull in the Memphis pyramid were using that to activate the energy of the pyramid to make it fully functional." Fully functional? Hmmm. Can there be any doubt he was right?